This year for Christmas I want world peace and Boozy Orange Mochas. I’ve been real good. Promise. The holidays are here. Right here. How are you celebrating this year? Do you pack up the car and travel through the woods, or is the house mellow with a small gathering? Maybe you gather with friends if family is far away. No matter the plans, there’s always one thing that seems to lace the holidays. You know, besides cheer and good will to people and all that stuff. STRESS. Finding the right present, cleaning the house, making the foods, the foods coming out wrong, seeing the friends, friends having presents for you but you don’t have presents for them. You know, holiday stress. Well, great news, for the both of us. The Christmas Pick-Me-Up Present is coming at you. Except instead of wrapping it and putting it under the tree, we’re putting it nice and warm in a coffee mug. Hello Boozy Orange Mocha! It’s a delicious way to survive the holidays. You know that expensive mocha latte you’re splurging on? Think of it with a little sweet orange infusion. Like a touch of warm weather to the cold New England air. And then we’re adding vodka, Chocolate vodka. Boozy Orange Mocha. But less expensive and without the stares. It might be a little weird if you’re pulling out vodka in the middle of Starbucks. You know they’re all just jealous but it still. 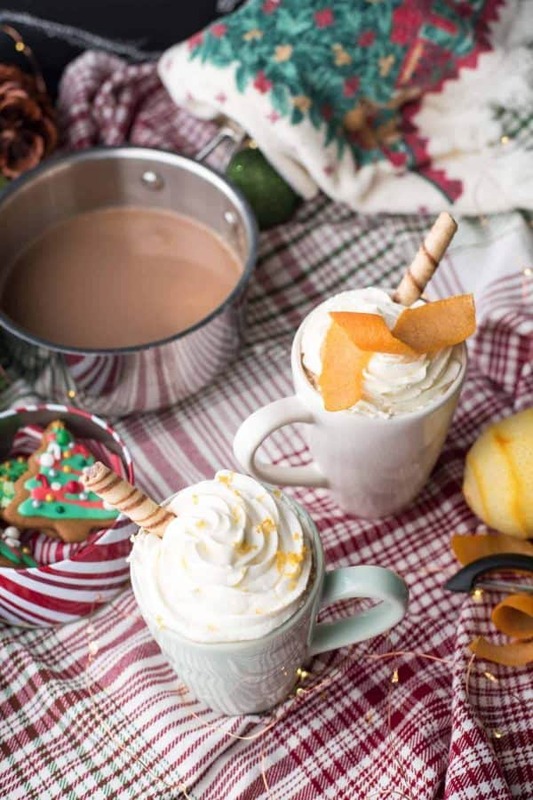 If you need a little kick starter to your holiday wrapping, Boozy Orange Mocha. 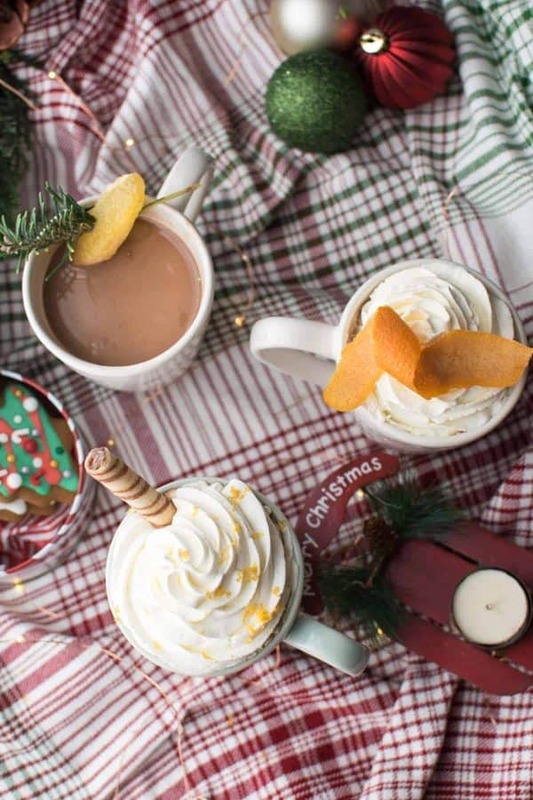 If you’re about to go walk about in the cold admiring the decorations…Boozy Orange Mocha. If you’re about to have your house invaded by family that you love dearly but maybe live a few hours away for a reason…Boozy Orange Mocha. Oh, vodka. My dear old friend. We broke up once. It was a sad time. But we’re back together now and stronger than ever. Like this time we made French Pear Cosmopolitans – a pear infused twist on the classic that also happens to be my favorite drink ever. Oh wait, no, these Sparkling Strawberry Martinis. Those might be my favorite. Gah, it’s hard to choose. 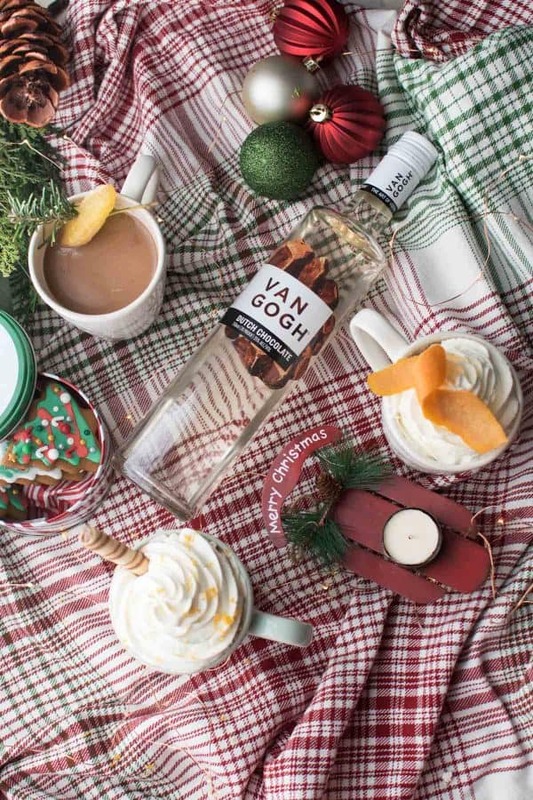 Because now there’s Van Gogh Dutch Chocolate Vodka and we’re adding it to our Orange Mochas to help make Christmas delicious. I’ve been working with Van Gogh Vodka since my post-college, can’t find a job years of bartending. The double espresso vodka? Fabulous espresso martinis. Or you know…Pumpkin Spice Latte Martinis. Smooth vodka, with deep infused flavors without cloying sweetness. The perfect fit for our Boozy Orange Mochas. 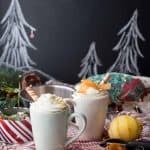 So if you’re looking for a holiday cocktail that will warm up your grinchy heart, whip up these Boozy Orange Mochas. You and your family will thank you. Or, you know, write to Santa. Vodka for this recipe is provided by Van Gogh Vodka. All opinions are my own, I hope you enjoy this festive cocktail. Merry Christmas! 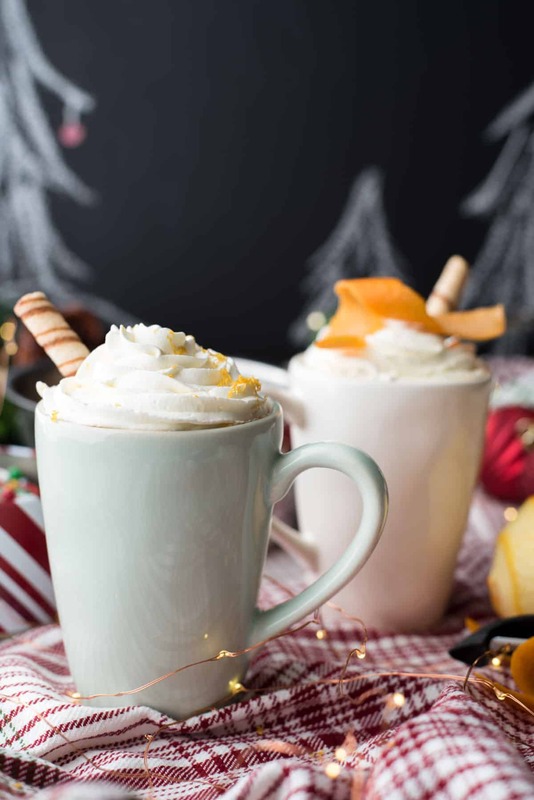 Boozy Orange Mocha with rich, cocoa flavor an infusion of fresh, zesty orange, and a touch of sweet creaminess with chocolate infused vodka. The perfect way to ring in the holidays! In a medium sauce pan over low heat, combine the coffee and sweetened condensed milk. Whisk in cocoa powder in batches to avoid clumps. Whisk thoroughly to corporate. Add orange peels and let steep for 5 minutes. Remove from heat and add Van Gogh Dutch Chocolate Vodka. Strain to remove orange peels and serve in your favorite holiday mug! ¹Use a vegetable peeler to remove the orange peels in long strips. You’ll want to remove these after steeping so the larger the piece the better. Just peel the zest/skin from the outside and try to avoid the bitter rind. Okay this might be the perfect addition to my Christmas party drink list!! It sounds AMAZING. I have this pinned for later. Can’t wait to make it! Okay, this looks and sounds so good! I really want to try! This looks so delicious! Your pictures make my mouth water! Thank you!! It was very good, especially today with the snow we got! This sounds so festive and looks so pretty! Thank you! It’s a great way to warm up! I am so pinning this. My boyfriend and I would so love drinking this. I hope you love it! It certainly was a great way to warm up this weekend! This looks absolutely scrumptious!! I need to make this drink for one the evenings at home! Thank you!! 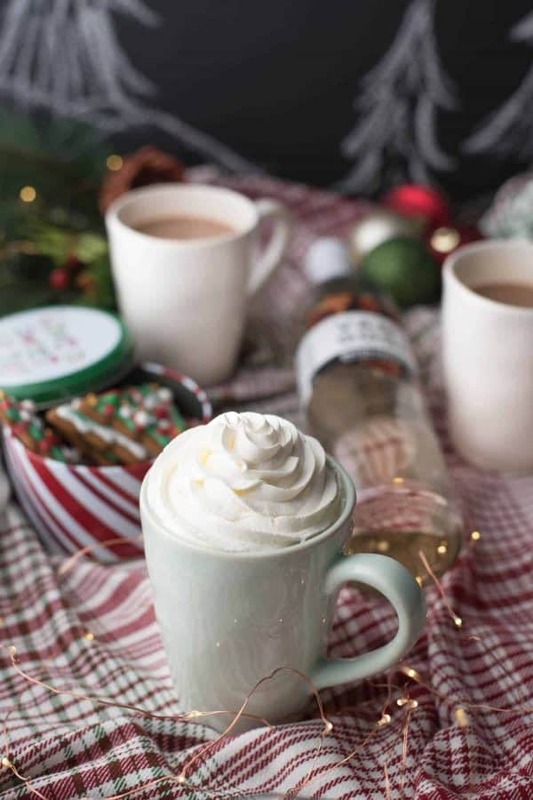 Definitely a great cozy beverage to drink in your pjs!